Batteries - The real Bottleneck to bigger mobile revolution! 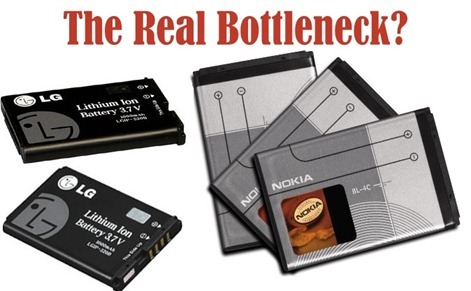 Batteries – The real Bottleneck to bigger mobile revolution! My first computer was PIII-550MHz, 64 MB RAM, 10 GB HDD. It ran Windows 98 and I was a proud owner. My first smartphone has processor- 800MHz, 256 MB RAM and 8 GB memory card and it irks me often. Sometimes it hangs while an app and sometimes it feels sluggish because of a live wallpaper. Nevertheless, it amazes me how far we have come. In 12 years my mobile holds more promise than my computer and the future is evermore bright. With Windows finally making its grand entrance to the smartphone ville (a late, very late but definitely grand) and the tablet market all the who’s who are on mobile. Soon, the smaller members like Mozilla’s OS will join but in essence the party is complete. With the kind of processing power and RAM in use and the way companies are finding new ways to keep the Moore’s law alive soon the tablets and phones might have better CPUs than our laptops. I am ecstatic. As I was sharing all this joy of mine with my friend, my phone pings me – Low Battery. And the whole joy goes to drain realizing that in all this ho-hum we forgot to bring the food to this party. My first phone did zilch. Only calls and messages were expected and it had its prowess in them. It though spoilt me in one habit- I was incapable of finding a charger in time. I needed it in two days or more and by the time the charger might be roaming in the room somewhere playing hide and seek. Now, I have a charger at home, one in car just in case and have more than once felt the need to charge the phone in my office. In 12 years, the processor Moored to 64 times; the battery, barely twice and that too being conservative. When Apple decided to make a tablet they almost attached a screen to a battery. Motorola sacrificed the thinnest tag of MotoRazr to increase its battery life. I am not saying there should be a Moore’s law governing the batteries as well but imagine if a battery would have improved half than a processor – to 32 times. This means that it would still be an improvement of 16 times over original batteries of 12 year old. Imagine your phone giving you 16 times more backup than now. That is almost charging your phone twice a month- only. All this is hypothetical I know but unless we imagine what we should have how can we strive towards it. The biggest problem is that the technology that drives a battery is still the same. A cathode and anode dipped in a solution which when connected gives energy and stores while charging. The solution changed from liquid to paste, the cathodes and anodes changed shapes and materials. Right now, Li-ion batteries are most popular. A new type is also present- Li-polymer but do not be fooled by the name. It is just a tiny upgrade. In tech terms, it’s probably just a service pack 1 or a Windows 7 to Vista. What we need is a radical change, something that redefines the term battery and charge storage. Refining an older technology can go so far before the results diminish to non-substantial. We can already see the implications with a limit reaching to how thin a device can be. Soon, its speed and brightness of the screen and every other ‘cool’ property will face the brunt. Optimizing software to use less battery is a duct tape fix, not a solution. Any company that can come up with a revolution in this field is bound to succeed on a level different from others. Maybe this task also lies in the hands of the “most innovative company”. I do not know when this will happen, if this will happen. I do know for sure that the next big thing in technology is not a faster phone but a better battery. IT Empowers – But Will it Make an Impact on Rural India? Will Xiaomi Be The Wrecking Ball For Other Smartphone Brands In India? Xiaomi Enters India Sooner Than Expected. Can They Become A Dominant Player? Better solution would be to have a ‘spare, fully charged battery’ instead of battery chargers. Keep one in house, one in car, one in office etc. samsung came out with solar batteries which I though was a great innovation.. but it seems to have fizzled out..